From Taoism, we get the concept of Yin and Yang, the idea that everything in the Universe has two sides which are called masculine and feminine. This concept has counterparts in almost every culture - the two pillars of Kabalah, the Ida and Pingala channels in Yoga, Jachin and Boaz, the sacred feminine, etc. This concept should not be confused with people’s physical gender. The idea is related but not a direct analog. Even in Christianity - a decidedly patriarchal system, there are many hidden references to the sacred feminine. One small example is, in early iconography, the Christ was frequently depicted inside a symbol known as the vesica piscis - which can symbolize (amongst other things) female genitalia. In these traditions, the masculine is the active side, while the feminine is recptive. In martial arts, external hard arts like karate exemplify masculine energy, while soft or internal arts like tai chi or jujutsu exemplify the feminine energy. In very high levels of even the harder masculine styles, the energy becomes more receptive and feminine. Jujutsu, sometimes called the “gentle art”, is actually better translated (from the perspective of context and meaning) as the art of defeating one’s opponents by receiving and yielding to their energy. I was recently listening to a lecture on Youtube by Paramahamsa Nithyananda who talked about enlighthenment being the awakening of feminine energy, and how all of Taoism is concerned with this (although it isn’t always spoken). 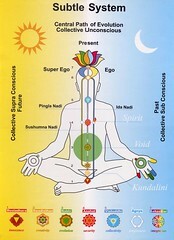 In Yogic circles the vital energy - kundalini- is described as a coiled serpent at the base of the spine. By awakening this energy and raising the energy up the spine to the crown - one can gain awakening. This energy is metaphorically linked to shakti - a hindu goddess. The idea of it reaching the crown is the marriage of shakti (feminine) with shiva (masculine). Again we have the balance of yin and yang. In Western alchemy we have the chemical wedding, in Taoism there is the greater enlightenment of kan and li. All these different cultures and psycho-spiritual teachings are talking about exactly the same thing but choosing different metaphors. I will include the video here, be forewarned - if you’re a fundamentalist you might have a hard time swallowing some of what he’s saying. If you can listen with an open mind - you just may get something from this.